This article explains why CODESOFT prompts the user for SQL username and password when opening a label file, and explains how to avoid this in the future. When opening a CODESOFT file that uses a SQL database connection setup with SQL Authentication (not Windows Authentication), CODESOFT prompts the user for SQL database credentials each time it is opened. In some situations, we do not want to put that burden on the end user; or for the end user to have that information. There are two methods of connecting to SQL server from CODESOFT: ODBC or OLEDB. ODBC (not the preferred method), is configured at the system (PC) level via ODBC configuration in the control panel. Unfortunately, ODBC does not allow the saving of password in the configuration. This means that each time a user wants to connect to the SQL server, he/she needs to enter a correct password. 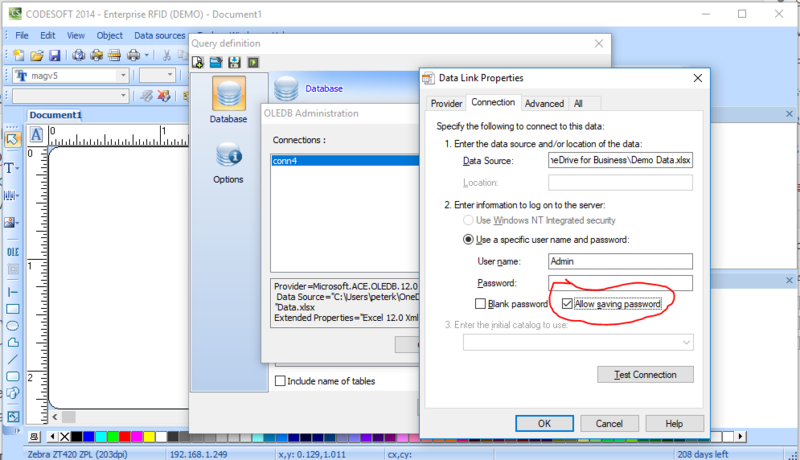 OLEDB setup is setup form inside CODESOFT (Data Source/Database/Create Edit Query). In the configuration steps there is a check box that allows saving of the password. Make sure that it is checked.